In the foreground is the Palestinian neighborhood of Sur Baher. Behind it on the hilltop is the Israeli settlement of Har Homa. (Photo: Yoav Galai). See Number ❸ below. BETHLEHEM (Ma’an) — An eight-month-old Palestinian baby died Friday from tear gas inhalation in Beit Fajjar village south of Bethlehem during clashes in the area, the Palestinian Ministry of Health said. 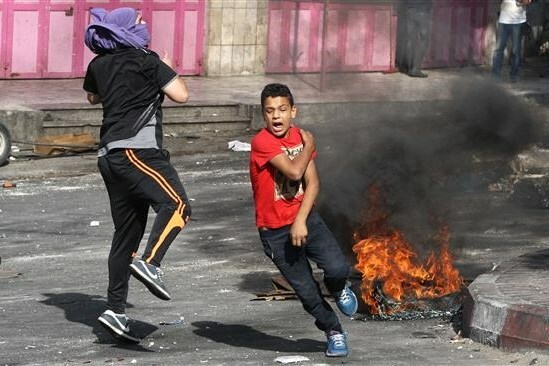 ____The ministry said in a statement that Ramadan Mohammad Faisal Thawabta died after inhaling tear gas when clashes erupted nearby between Palestinians and Israeli military forces. 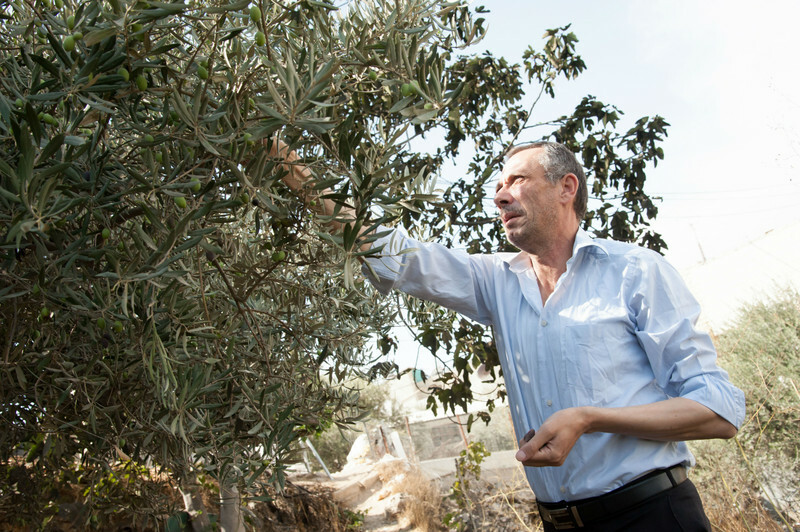 NABLUS (Ma’an) — Israeli settlers on Saturday prevented Palestinian farmers from accessing their olive fields on the outskirts of Burin village near Nablus in the occupied West Bank, locals said. ____Local sources told Ma’an that dozens of settlers blocked entrance of farmers to their land while Israeli soldiers stopped two busses carrying volunteers en route to assist Palestinians in the olive harvest. ____The busses were stopped on the main road between Nablus and the illegal settlement Yitzhar [. . . . .]. 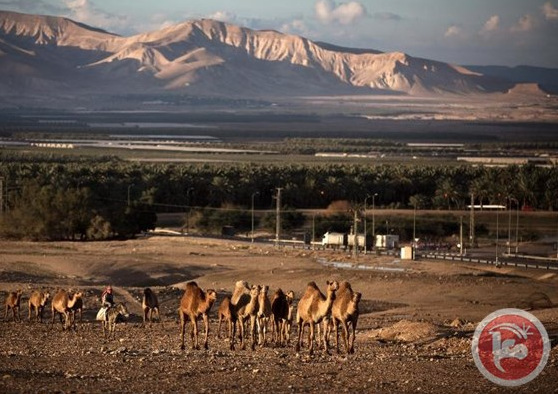 ____Locals added that Israeli settlers also stole olives and farming equipment from Palestinians in the Bab Sanna area of Burin, which is completely surrounded by illegal Israeli settlements to the north and west. 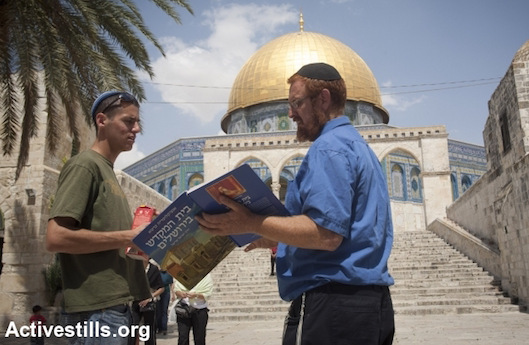 Redrawing the map of Jerusalem will not lock out potential attackers. Instead, it will only spark the sort of reaction one could expect following the wholesale nullification of rights from a significant number of Palestinians. With so much being written about the volatility of the status quo on Jerusalem’s Temple Mount, a bigger picture of a deeply divided city breaking apart is becoming lost. On Sunday, Israel’s Channel 2 reported that the government is considering revoking the residency status of Palestinians in East Jerusalem who live beyond the separation barrier. Though this would potentially remove tens of thousands of Palestinians from the city, such a move is only possible today due to a series of actions taken by municipal and state authorities over years. Israeli soldiers shot and killed, earlier Saturday, a Palestinian teenager in the al-Jalama Israeli military roadblock, north of Jenin, in the northern part of the occupied West Bank. ____Eyewitnesses said the soldiers fired several rounds of live ammunition on the child, inflicting several serious gunshot injuries, causing him to die of his wounds later. ____The Red Crescent Society in Jenin said the soldiers prevented its medics from reaching the seriously wounded teen, and left him to bleed, before dragging his body behind the main gate of the military terminal. From Today In Palestine. Photo by Dareen Tatour. Young and strong, with a stone in one hand and a bullet in the neck is the image du jour right? Young, with a school-book bag on his back, running home after the end of the school day, shot, left to bleed; his hands reach out in front of him hoping someone will help him up, a strangled call for mama comes out and the video ends. A mother buries her seventeen-year old, another her thirteen-year old, and another her twenty-something son, the bookworm with the contagious smile. All these murdered young souls, and more, have been our daily dose of the reality we live in. Our children, the hope for a better future, are moving targets with trigger-happy Israeli occupation forces aiming and shooting to kill. and the seas catch fire? Do we shell roads until daybreak? and the morning, like bullets, is bearable. and the siege pursues us. While it is carried by the sea. From ANTHOLOGY OF MODERN PALESTINIAN LITERATURE. Ed. Salma Khadra Jayyusi.Trans. May Jayyusi and Jeremy Reed. New York: Columbia University Press (August 15, 1994). The Health Minister has reported that 68 Palestinians have been killed, and 921 Palestinians have been shot and injured with live Israeli army rounds, since the beginning of this month, in the West Bank and the Gaza Strip, while 855 were shot with rubber-coated steel bullets, and 208 suffered fractures and bruises after being assaulted and beaten by soldiers and fanatic settlers. New polls find that a majority of Jewish Israelis support the ‘voluntary transfer’ of West Bank Palestinians, a majority want to strip East Jerusalem Palestinians of Israeli residency. The latest crisis of violence has become a successful campaign of terror: Israelis are profoundly shaken. 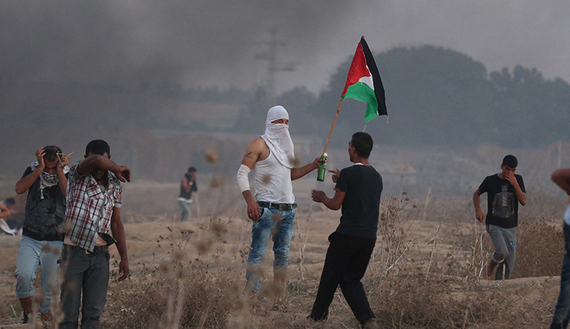 Many have reverted to the Second Intifada mentality of personal risk calculations based on self-selected danger factors and fingers in the wind. BETHLEHEM (Ma’an) — Two Palestinians were shot in the Nablus district on Friday after allegedly attempting to stab an Israeli border policeman, Israel’s army said. ___An Israeli army spokesperson said two Palestinians tried to stab an Israeli border policeman at the Tappuah, or Zatara, military checkpoint south of Nablus. ____Both alleged attackers were shot, he added. JERUSALEM (Ma’an) — Israeli settlers on Thursday prevented a Palestinian family from entering their home in the Batan al-Hawa area of Silwan in occupied East Jerusalem, a local organization said. ____Wadi Hilweh Information Center said that Israeli settlers who live in the area prevented Rania Abu Nab and her four children, aged 4 to 14-years-old, from entering the home, before Israeli police arrived at the scene reportedly in support of the settlers [. . . . .]. ____Abu Nab said she had left her home to meet with UNRWA employees, who were prevented from visiting her at home by Israeli settlers in the area. The third explosion in the Palestinian struggle for freedom from occupation finally came in October of this year, sparked by the Israeli minister of defense banning the Palestinian Murabitun from entering Al-Aqsa mosque, either for tutorials or maintenance and protection roles, something they have been doing for decades. The Israeli action spread like wildfire across the West Bank and Gaza, as though the Palestinians were shaking off the decades of accumulated humiliation under the occupation. ____The future of the Arab –populated Jerusalem where Al-Aqsa mosque is located was decided by Israel as soon as the guns fell silent after the 1967 war and Israel was triumphant and drunk with a heady sense of power. On 18 June of 1967, the government of Israel annexed East Jerusalem and the surrounding area, and extended the Israeli laws to it. This action was supported by all Israeli political and civil society factions, secular and religious, and across party lines. 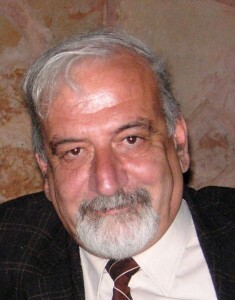 From: El-Asmar, Fouzi. THE WIND-DRIVEN REED AND OTHER POEMS. Washington, D.C.: Three Continents Press, 1979. HEBRON (Ma’an) — Palestinians across the southern West Bank district of Hebron are set to rally on Tuesday in protest against Israel’s decision to withhold the bodies of 11 Palestinians shot dead by Israeli forces this month. ____Palestinian factions across Hebron called for the “rally of anger” to march from al-Haras mosque in Hebron’s city center to Ibn Rush Square. Israeli forces late Monday and early Tuesday detained 46 Palestinians, including minors, from across the West Bank districts, including Jerusalem, bringing the total number of Palestinians detained since the beginning of violent unrest in October 1, 2015, to 1085, according to local and security sources. ____Forces detained nine Palestinians during a raid and search campaign conducted across the Hebron area. 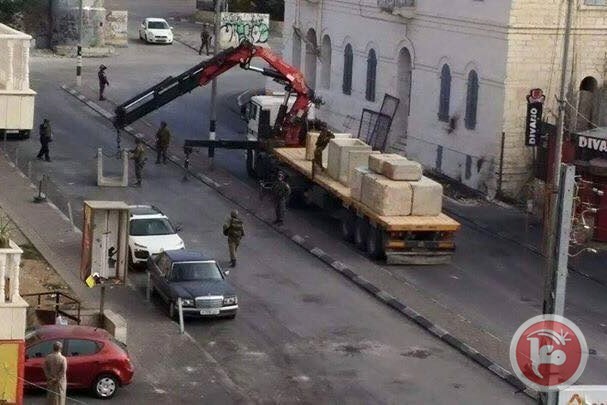 ____In Hebron city, army soldiers detained four Palestinians after raiding and wreaking havoc into their homes. Israel must refrain from taking any unilateral steps in Jerusalem; Anadolu Agency reported a UN spokesperson as saying yesterday. 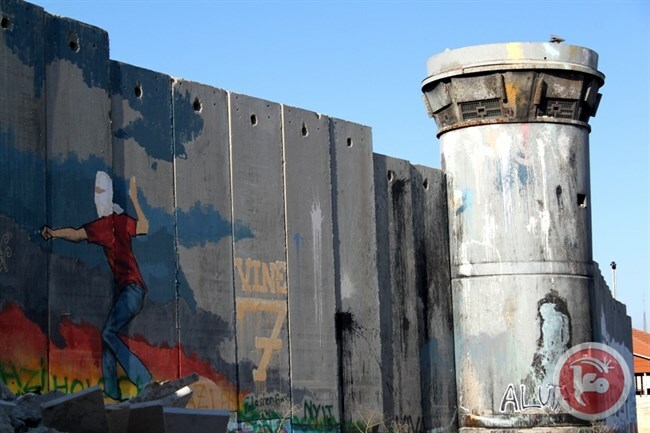 ____UN Secretary-General Ban Ki-moon’s spokesperson Stephane Dujarric’s comment came after Israeli media reported that Israeli Prime Minister Benjamin Netanyahu plans to revoke the residencies of Palestinians living in the East Jerusalem side of the Separation Wall. [. . . . .] “But of course, Albert Aghazarian!” The mere utterance of his name usually precipitates numerous stories about Al-Ustaz, the teacher… the Old City’s walking encyclopedia who knows the history of Jerusalem up to its each and every stone. ____So naturally, the Arab world cannot be ‘okay’ if Palestine is not ‘okay’. Nor yet the links of chains. With her very eyes she fights. With wheat shall fill the valley. From Poem Hunter. http://www.poemhunter.com/poem/on-man/ Web. 26 Jun 2015. ❺―A: Can Netanyahu say just what he likes? Jordan and Israel have agreed to install 24-hour surveillance in Jerusalem’s Al-Aqsa Mosque compound in a bid to reduce recent tensions over Islam’s third holiest site, U.S. Secretary of State John Kerry announced in Jordanian capital Amman on Saturday. ____” I am also very pleased to announce today that [Israeli] Prime Minister [Benjamin] Netanyahu has agreed to what I think is an excellent suggestion by [Jordanian] King Abdullah to provide 24-hour video coverage of all sites on the Temple Mount/Haram al-Sharif”, Kerry said during a press conference with his Jordanian counterpart Nasser Judeh. BETHLEHEM (Ma’an) — A Palestinian suspect was shot and killed after stabbing an Israeli in Hebron on Monday, Israel’s army and media reported. ____An Israeli army spokesperson said a Palestinian stabbed an Israeli in the neck near Beit Einun junction north of Hebron and was shot and killed at the scene. ____The Israeli, who is reportedly 19-years-old, was taken for medical treatment at the Shaare Zedek Medical Center in Jerusalem with serious injuries. ____Israel’s army could not confirm whether the Israeli victim was a soldier or a settler, after conflicting reports in Hebrew-language media. 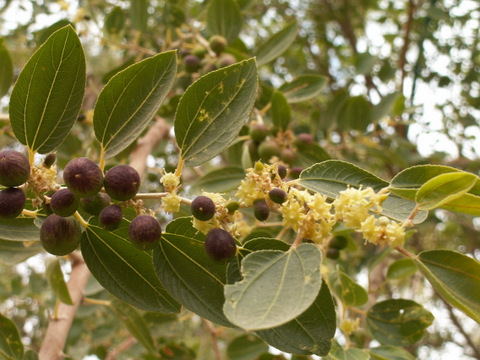 NABLUS (Ma’an) — Israeli settlers attacked Palestinian farmers harvesting olives on their land east of Nablus on Monday, a local monitor told Ma’an. ____Ghassan Daghlas, who monitors settler activity in the norther West Bank, told Ma’an that a group of settlers from Elon Moreh threw rocks at farmers in the Azmut and Deir al-Hatab areas east of Nablus. ____The farmers were forced to leave their land despite having organized access to their fields through the Palestinian and Israeli liaison offices. ____Settlers also attacked a 66-year-old man, identified as Hajj Tawfiq, moderately injuring him, Daghlas said. ____According to Palestinian media reports, al-Azzeh, who suffered from a heart condition, began feeling chest pains while in his home in the Israeli-controlled Tel Rumeida neighborhood of the occupied West Bank city. ____“There was no chance to get an ambulance there,” Hisham Sharabati, coordinator of the Hebron Defense Committee and a field worker for the Palestinian human rights organization Al-Haq, told The Electronic Intifada. Israeli forces do not allow Palestinian vehicles to drive on the streets near his home, which are reserved for Jewish motorists. Haftom Zarhum, a 29-year-old Eritrean, was lynched by Jewish Israelis simply because he looked different. After being shot in the legs, a mob circled him like hyenas over a bleeding prey throwing a bench over his head and chanting the unofficial Zionist’s anthem of hate: “Death to Arabs, Arabs out!” and “Am Israel Hai”. ____Screaming at an injured Palestinian child soaked in blood, a racist mob lynching Zarhum, or killing a Jew who was mistaken for a Palestinian were further manifestations of Israel’s culture of hate. 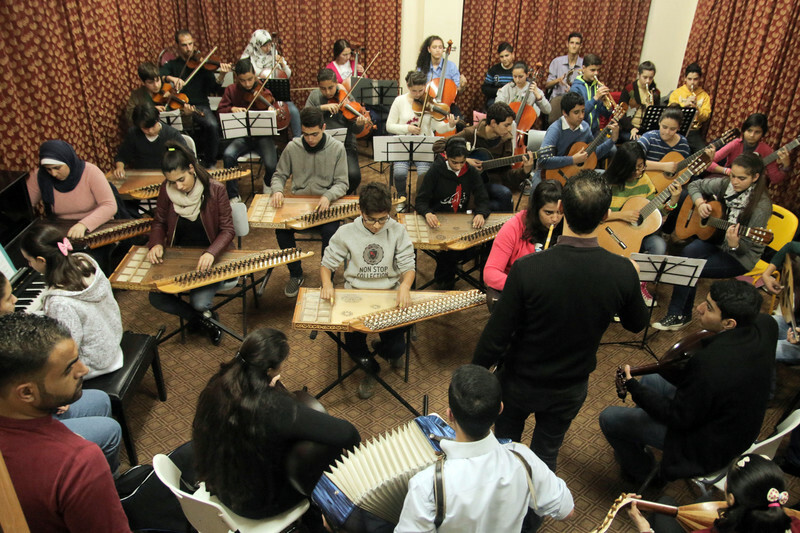 It was espoused by no less than Israeli minister of culture, and supported by the majority of Israelis. CAN NETANYAHU SAY JUST WHAT HE LIKES? Have you forgotten your shame at Buchenwald? Do you remember your flames at Buchenwald? a sign for the planet. Do you remember? Or not? remain among the wreaths of flowers . . .
From Al-Qasim, Samih. SADDER THAN WATER. New and Selected Poems. Trans. Nazih Kasis and Adina Hoffman. Jerusalem: Ibis Editions, 2008. About Samih Al-Qasim. Obituary, August 20, 2014. 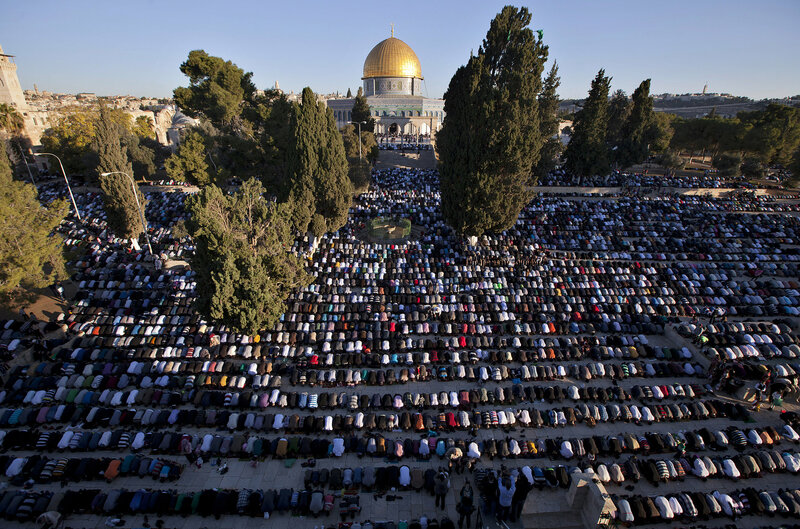 Muslims gathered at the Al-Aqsa Mosque compound in Jerusalem for the Eid al-Adha prayers. 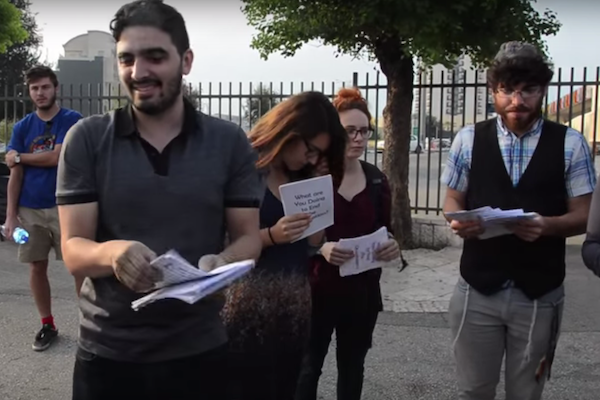 Jewish anti-occupation activists hand out flyers to delegates at the World Zionist Congress, Jerusalem, October 20, 2015. (Photo: Laura Gottesdiener). See number ❸ below. JERUSALEM (Ma’an) — A Palestinian family in occupied East Jerusalem demolished its own home on Saturday in order to avoid the Israeli municipality’s demolition. ____The house, which totaled 100 square meters, was built in 1998 in the Beit Hanina neighborhood of East Jerusalem, and had been housing Abeer al-Rajabi, her husband, and six children, aged six to 18 years old. ____Abeer’s father, Elias, told Ma’an that the Israeli authorities had delivered several demolition orders in recent years, with the final order issued in April. ____The order gave the family until Oct. 24 to execute the demolition, after which point they would be charged 60,000 shekels ($15,430) in demolition expenses. 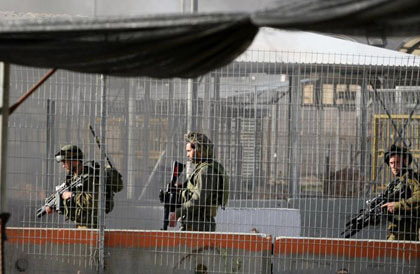 BETHLEHEM (Ma’an) — An Israeli settler shot and seriously injured a young Palestinian man on Sunday morning in the Wadi Sair area near the illegal Israeli settlement bloc of Gush Etzion, southeast of Bethlehem, Palestinian security sources said. ____The settler claimed, according to Israeli reports, that a Palestinian attacked him with a knife. ____Palestinian security sources told Ma’an that an Israeli settler shot 20-year-old Azzam Azmi Shalalda four times while he was in his agricultural field, after the actual person suspected of carrying out the alleged attack had reportedly already fled the scene. ____After the shooting, Shalalda was evacuated to al-Mamoon clinic in Sair for first aid, before he was taken to al-Ahli Hospital in Hebron. Medics say he is in a critical condition. While Netanyahu was busy blaming a Palestinian for the Holocaust, a group of Jewish activists asked the World Zionist Congress what it was planning to do to end the occupation. Hours before Prime Minister Benjamin Netanyahu made headlines for telling the World Zionist Congress that a Palestinian inspired Hitler to exterminate the Jews, a group of Jews from around the world came to that very same congress to remind delegates of the conditions in which Palestinians live [. . . . .]. Oct. 25, 2015 (WAFA) – Extremist Jewish settlers from the so-called ‘price tag’ group at dawn Sunday set a Palestinian-owned car on fire and spray painted racists graffiti on walls in Um Tuba, a village just southeast of Jerusalem, according to local sources. ____According to witnesses, settlers from the ‘price tag’ group set a car ablaze and painted racist slogans that call for the killing of Palestinians, in addition to the Jewish Star of David. The car belongs to local Nayef Abu Tair. ____The group has conducted similar attacks in Jerusalem and across the West Bank in recent years. ____Violence by illegal Jewish settlers is commonplace. They have repeatedly attacked Palestinian property and worship places. Settler violence includes property and mosques’ arsons, stone-throwing, uprooting of crops and olive trees, and attacks on vulnerable homes, among others. Benjamin Netanyahu and Mahmoud Abbas will never make peace. They will never succeed at stopping the violence, and they will never see eye to eye on anything other than the incompatibility of their respective visions. ____Don’t get me wrong: both men want peace. Even Benjamin Netanyahu . . . . is a master politician whose worldview dictates that the Jewish people will never be safe and that Muslims in general, but Palestinians in particular, are the greatest threat to it. ____That world view is the driving force behind the only two issues in which Netanyahu has ever fully invested himself in his political career: preventing Iranian nuclear proliferation, and ensuring that Israel does not give up strategic military control of the West Bank and Gaza. It’s not that he wants to rule over the Palestinians, it’s just that they happen to live on the land over which he will never agree to cede control. 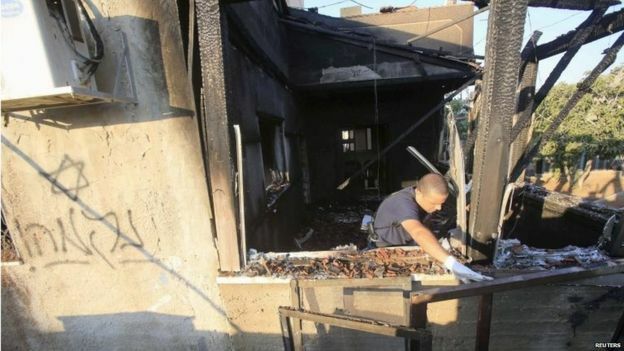 An 18-month-old boy and his parents were killed in a night-time attack on two homes in the village of Duma.The Hebrew word for “revenge” and a Star of David were found sprayed on the wall of one of the gutted houses. July 31, 2015. (Photo: BBC News). See number ❹ above. 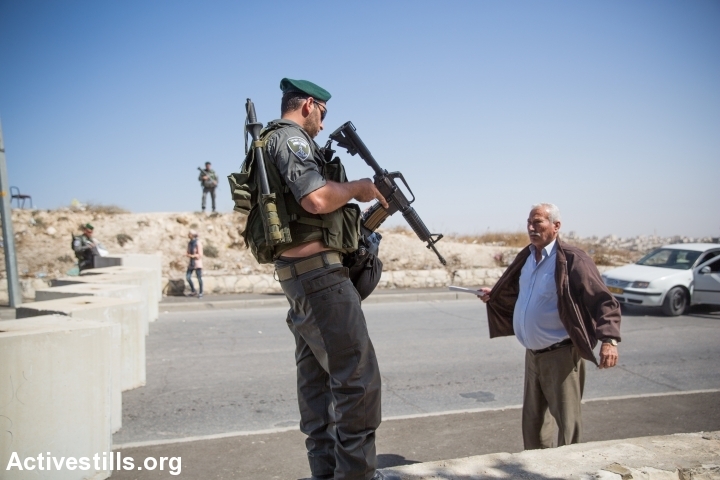 Soldiers at AL JALAMA CHECKPOINT pursuing Palestinian youth (PCHR photo). See ❷ below. ❶ Analysis: Has Netanyahu’s revisionism ended the use of the Holocaust as enabler of Israeli injustice toward Palestinians? HAS NETANYAHU’S REVISIONISM ENDED THE USE OF THE HOLOCAUST AS ENABLER OF ISRAELI INJUSTICE TOWARD PALESTINIANS? AS NETANYAHU’S HOLOCAUST REVISIONISM continues to find its way around the world, Jewish memory is besmirched. . . . Buried in the outrage, though, is a deeper issue: Is Netanyahu’s use of the Holocaust to further incite his political constituency against Palestinians what we should focus on? Or is it the fact that many of those who condemn Netanyahu for his Holocaust blunder are also enablers of the destruction of Palestine? ____The almost panicked desire to separate the real culprit of the Holocaust, Hitler, rather than an irrelevant side-kick, the Grand Mufti of Jerusalem, is telling. It is also too easy. Separating the two, while important, is a distraction from the real and ongoing culprit in the suffering of Palestinians – the correct, substantial, highly prestigious, well-funded, real history of the Holocaust. JENIN (Ma’an) — A Palestinian youth was shot dead Saturday near al-Jalama military checkpoint north of Jenin in the occupied West Bank after he allegedly attempted to stab an Israeli security guard, eyewitnesses and the Israeli army said. ____Eyewitnesses told Ma’an that “there were no stabbing attempts” at the time that Israeli forces opened fire at a 16-year-old Palestinian at the crossing. ____The forces then dragged the injured youth inside of the checkpoint preventing Palestinian Red Crescent ambulances from reaching him for treatment, eyewitnesses added. ____The youth has not yet been identified. GAZA CITY (Ma’an) — A Palestinian succumbed to his injuries on Friday evening after being shot in the head by Israeli forces during a demonstration in the Gaza Strip last week, Gaza’s Ministry of Health said. ____Ashraf al-Qidra identified the man as Yahya Karira, 20, from al-Tuffah neighborhood. He told Ma’an that Karira was shot when clashes erupted between Israeli forces and Palestinians in Nahal Oz in the eastern Gaza Strip. ____Karira is the 16th Palestinian to be killed by Israeli forces in the Gaza Strip since the beginning of the month. Fourteen have been shot with live ammunition during clashes, and a two-year-old and her pregnant mother were killed in an Israeli airstrike. Israeli soldiers have kidnapped, late on Friday at night and on Saturday at dawn, eleven Palestinians, including two children, in different parts of occupied Jerusalem. 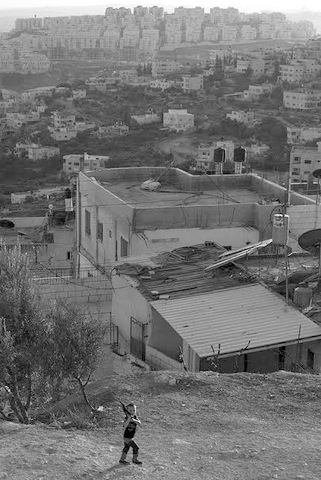 ____The Wadi Hilweh Information Center in Silwan (Silwanic) said the soldiers invaded the al-‘Eesawiyya town, south of the Al-Aqsa Mosque, searched several homes and kidnapped Wajdi Mahmoud, Daoud Yousef Atiyya, Abed Dari and Mohammad Ali Nasser. ____When Palestinian political movements and civil society engage in non-violent protest, they are met with tear gas and military barricades. Those who launched the BDS movement are labeled “Jew-haters” and their supporters worldwide accused of functioning as a “band of anti-Semites and hypocrites”. Confined in their enclaves, cut off the outside world, surrounded by Jewish settlements, Palestinians are supposed to acquiesce to their fate and suffer in silence. ____The sporadic flares of violence, born out of frustration and despair, are systematically decontextualized and misunderstood. They are depicted as a resumption of violence as though the occupation was not in and of itself a form of violence. Where is the green light…? John Mikhail Asfour, trans, and ed., When The Words Burn: An Anthology of Modern Arabic Poetry, 1945–1987 (Dunvegan, Ontario: Cormorant Books, 1988). Pp. 237. Mu’in Tawfiq Bseiso, a poet from Gaza who lost his homeland with hundreds of thousands of other Palestinians after the foundation of an Israeli state, (born 1926, also spelled Mueen Bessissou or Bsayso) suffered the tragedy of his country. He was exiled to Egypt. His exile intensified both his nationalism and the universal dimension of his poetry, for he linked the Palestinian tragedy with the tragedies experienced by other nations. A Palestinian is evacuated after being injured by a tear gas canister during clashes with Israeli forces near the Nahal Oz border crossing, east of Gaza City on Oct. 10, 2015. (Agence France‑Presse/Photo Mahmud Hams). ❶ What’s happening on Gaza-Israeli border? WHAT’S HAPPENING ON GAZA-ISRAELI BORDER? BEIT HANOUN, Gaza Strip — Clashes have suddenly erupted along the southern, eastern and northern borders of the Gaza Strip. This has raised concerns that Gaza will never experience stability. ____Palestinian youths have insisted on reaching the iron fence separating the Gaza Strip from the Green Line from the eastern Bureij refugee camp. On Oct. 10, and the days that followed, they managed to cross the fence and hang the Palestinian flag. ____For the first time in years, demonstrators managed to cross the border; after Israel withdrew from Gaza in 2005, it imposed a buffer zone of between 600 and 1,000 meters (1,968 to 3,280 feet) at the border. BETHLEHEM (Ma’an) — A major military checkpoint separating Bethlehem and Jerusalem was shut down Thursday morning in preparation for Jewish pilgrims to enter a religious site in the area. ____The Israeli Civil Administration said in a statement that Checkpoint 300 would remain closed for three days, returning to normal operation on Monday morning. ____The statement referred to the closure as a “security procedure” taken before thousands of “Jewish people are expected to flock to the nearby Rachel’s Tomb” to commemorate the anniversary of the biblical figure’s death. ____The site is surrounded on three sides by the Israeli separation wall despite being in the middle of the Palestinian city of Bethlehem. . . .
HEBRON (Ma’an) — Israeli forces detained 10 Palestinians in overnight arrest raids in the occupied West Bank, Israel’s army and locals said Friday. . . . In the district of Hebron. . . . from the village of al-Samu. . . . in the Ramallah district. JERUSALEM, October 22, 2015 (WAFA) – Israeli security forces Thursday shot dead a youth and seriously injured another one for allegedly stabbing an Israeli settler in the settlement town of Beit Shemesh, west of Jerusalem, according to police sources. ____Israeli police said the two men attempted to mount the rooftop of an Israeli bus in Beit Shemesh, but they were unable to do so, before they allegedly stabbed an Israeli youth outside the bus . . . .
____The youth who was killed was identified as Meqdad al-Haj, 20, from the town of Surif near Hebron. The other youth . . . was transferred to Hadasah Medical Center in Jerusalem or medical treatment. Despite the festival of mockery taking place on social media, Benjamin Netanyahu clearly does not believe that Grand Mufti Haj Amin al-Husseini is more responsible than Hitler for the Holocaust . . . . Netanyahu is a smart guy who knows World War II history better than most of his critics. The idea that the mufti is responsible for the extermination of European Jewry is completely absurd, and Netanyahu knows that . . . . he wasn’t even talking about the Nazis, and he certainly never meant to absolve them for the Holocaust. The prime minister was trying to make a statement about the Palestinians and that’s the real problem. Who loves the winter as you do? And is fascinated by trees that resist the wind as you do? If only you were beside me now! BETHLEHEM (Ma’an) — One Palestinian was killed and one critically injured by Israeli police in Beit Shemesh, west of Jerusalem, on Thursday after an alleged stabbing attack, Israeli media and police said. ____An Israeli police spokesperson told Ma’an that two Palestinians attempted to board a children’s bus in the city but were blocked from entering, before stabbing an Israeli man in his twenties. Israeli police arrived on scene and shot the suspected attackers. 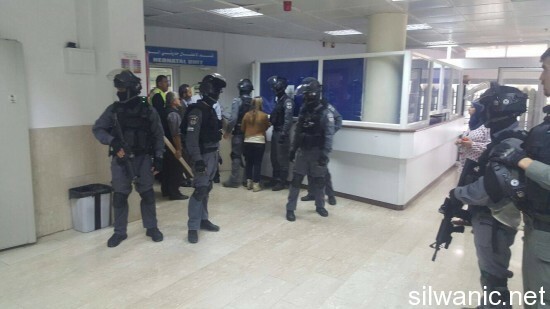 ____The two men, along with the Israeli, were transferred to Hadassah hospital in Ein Karem. ____Israeli media reported that one of the suspected attackers was dead upon arrival to the hospital, the other left in critical condition. 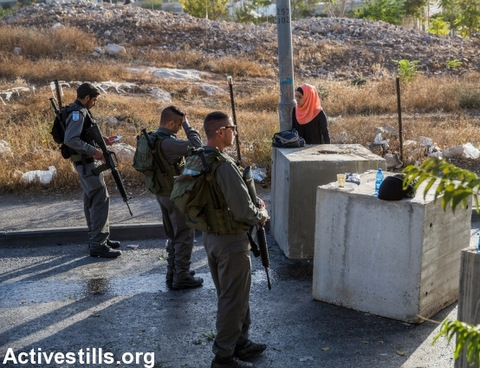 The Israeli man sustained moderate injuries in his upper body. Let’s talk about life for a moment, about how we can live in this city. Let us set aside for now the differences of opinion on sovereignty and eternity and talk about this moment, in which we can still steer matters to their semi-sane course, and can still safeguard with the fragile, imperfect, problematic reality that we had here until a few days ago. It is difficult to believe, but we may yet miss this reality as a yearned-for island of near-normalcy that we have lost for some time. ____Let us make no mistake. Even if in a week, two weeks, a month, a year, the concrete barriers are removed that are now blocking the entrances and exits of the Palestinian neighborhoods . . . we will no longer be able to erase the stinging memory of the concrete barriers that we set up between us and them. The ones that have turned their home in the heart of the city into a series of shunned and isolated ghettos. ____These walls have already built unseen fences of hatred and will continue to exist in our midst as a malignant poison. BETHLEHEM (Ma’an) — Israeli forces shot and killed a Jewish man in central Jerusalem overnight Wednesday after mistaking him for a “Palestinian attacker,” Israeli police and media said. ____Israeli media said the man was shot after he attempted to grab a weapon from Israeli security forces after an argument. The man was identified as a Jewish-Israeli from his identity card. ____Other reports said a private security guard shot the man after an altercation as he was getting off a bus in the center of Jerusalem. News sites around the world today are talking about Israeli Prime Minister Benjamin Netanyahu’s assertion in a speech yesterday that Hitler didn’t want to kill the Jews, just expel them, till he was convinced to exterminate them by the Palestinian leader, Haj Amin al-Husseini, the Grand Mufti of Jerusalem. The criticism is so universal, and angry, that the remarks look to be a landmark in Netanyahu’s cynicism. . .
____Yet, in the face of the criticism Netanyahu is doubling down on his contention that Palestinians incited the holocaust. Here is what he said today before leaving to Berlin [. . . . .]. ____Meanwhile, Germany says it has no idea what Netanyahu is talking about. ____The steady erosion of Fatah and Hamas’ authority during the post-Oslo years, as the Palestinian factions proved incapable of protecting their people from the structural violence of the occupation, has driven Palestine’s politically orphaned children to the streets, armed with stones. ____The growing hopelessness and sense of abandonment have led a few so-called “lone wolves” to vent their fury on Israelis with improvised weapons such as knives, screwdrivers and cars. These attacks have attracted the most publicity, becoming the equivalent of the second intifada’s suicide bomber. But they serve chiefly as a barometer of Palestinian despair. EAR OF CORN: Don’t kill me before my time is up. Is honey . . .
Don’t ki . . .
From by Adonis, Mahmud Darwish, Samih al-Qasim. VICTIMS OF A MAP: A BILINGUAL ANTHOLOGY OF ARABIC POETRY. London: Saqi Books, 2008. BETHLEHEM (Ma’an) — A Palestinian was shot dead by Israeli forces during clashes in Beit Awwa west of Hebron, Palestinian sources said. The Palestinian Authority Ministry of Health identified the Palestinian as 24-year-old Udaay Hashim al-Masalma, and said that doctors in Hebron’s public hospital confirmed a bullet to the head was the cause of death. ____An Israeli army spokesperson alleged that Masalma was shot after he attempted to stab an Israeli soldier during a “violent riot” in Beit Awwa. ____She said the soldier “responded with live fire,” and that the Palestinian was evacuated for medical treatment by the Palestinian Red Crescent. ____She added that the Israeli soldier was lightly injured, and as far as she was aware, had not been evacuated for medical treatment. TUBAS (Ma’an) — Israeli forces on Tuesday delivered demolition orders to two Palestinian families in the northern Jordan Valley, notifying them that their tin shacks and tents would be destroyed in less than a month. ____Local sources said the structures belonged to the families of Lutfi Muhammad Bani Audah and Muhammad Ali Bisharat and would be destroyed on Nov. 8. ____The families said that the structures slated for demolition were built several years ago and that they have official deeds to prove their ownership of the land. The Palestinian Health Ministry has reported, Monday, that the number of Palestinians, killed by Israeli fire since the beginning of this month, has arrived to 45, including 10 children, in addition to a political prisoner who died of medical neglect. ____The Ministry said the youngest slain Palestinian was 16 months of age, and that eight of the children were killed in the West Bank, and two in the Gaza Strip. ____It stated that 31 Palestinians have been killed in the occupied West Bank and Jerusalem, and 14 in the Gaza Strip, including a mother and her infant, in addition to a young man in the Houra area, in the Negev. ____As for wounded Palestinians, the Ministry said 1850 were shot with live rounds and rubber-coated steel bullets; some suffered burns and others were beaten and assaulted by soldiers and settlers, while more than 3500 suffered the effects of tear gas inhalation. Jeffrey Goldberg wrote a powerful piece in The Atlantic last week claiming to scrutinize Palestinian violence . . . . Goldberg starts by discussing Palestinian “paranoia” over Israel’s actions in Jerusalem and ends with a broader, more common claim: that the Palestinian refusal to recognize Jewish ties to the land of Israel is the primary source of the conflict’s intractability, replete with its frequent rounds of violence. ____There are many holes in this theory, and I’d like to point some of them out. [. . . . .]. ____. . . The belief that Palestinians are invaders or mere guests in this land and that their own ties to the Temple Mount are a political hoax is widely held in Israel’s right wing. My first stop, after living for 22 years in a refugee camp in Gaza, was the city of Seattle. . . . There, for the first time, I stood before an audience outside Palestine, to speak about Palestine [. . . . .]. ____Here, I learned, too, of the limits imposed on the Palestinian right to speak, of what I could or should not say. 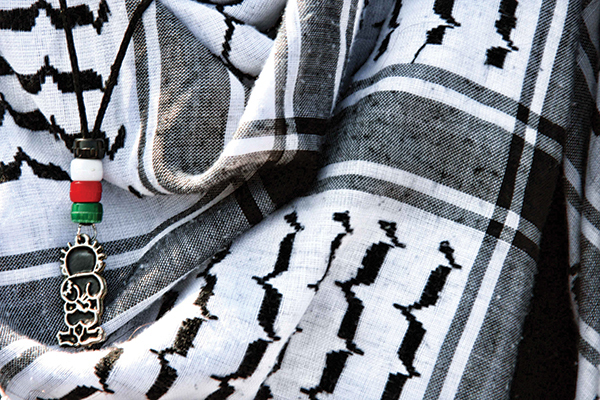 Platforms for an impartial Palestinian discourse were extremely narrow to begin with, and when any was available, Palestinians hardly took center stage [. . . . .]. ____However, after spending almost two decades living in the US, Europe, Asia, the Middle East and travelling across the globe to speak about human rights – starting with Palestinian rights, history and struggle – I began to grasp the seriousness of an unmistakable trend: where the Palestinian narrative is marginalized and fundamentally misunderstood [. . . . .]. ____So it was not uncommon to see an entire two-day conference on Palestine divided into several sessions and many workshops without a single Palestinian on the podium . . . . the frame of mind that neglected or avoided the Palestinian narrative has not been defeated completely. In the hands of freedom fighters! 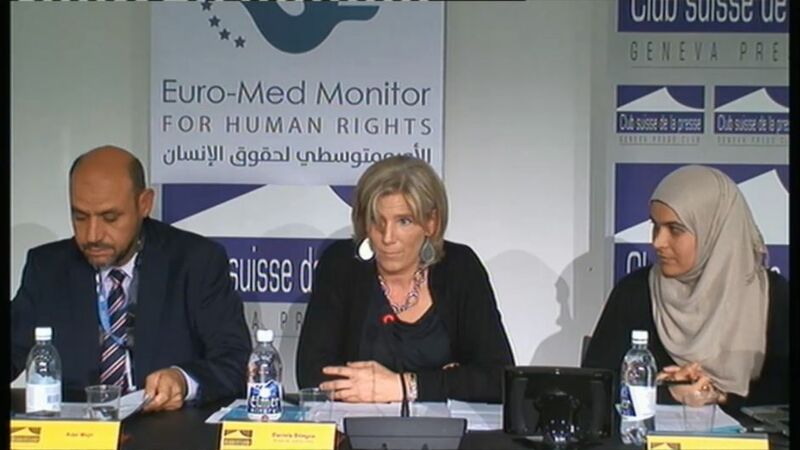 Euro-Mediterranean Human Rights Monitor press conference in Geneva. October 16,2015 (Euro-Med photo) See ❹ below. JERUSALEM (Ma’an) — At least nine Palestinians were left homeless on Monday after settlers escorted by Israeli security personnel forcibly evicted them from their homes in the Silwan neighborhood of East Jerusalem. 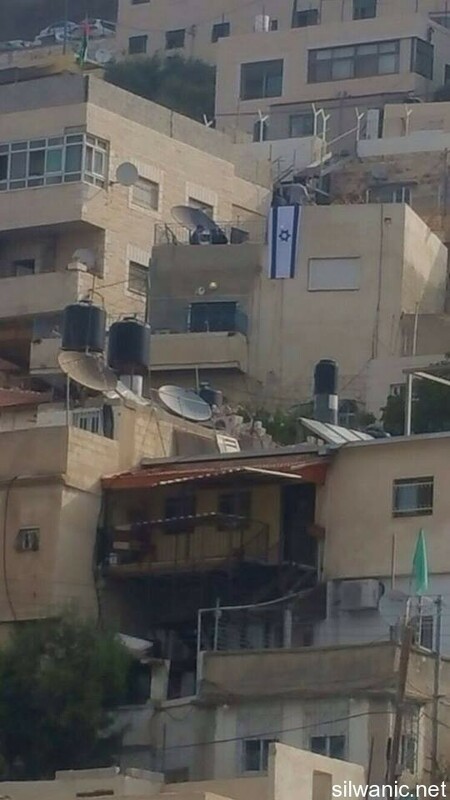 ____The Silwan-based Wadi Hilweh Information Center said a large group of Israeli border police and officers escorted staff from the far-right Israeli Ateret Cohanim organization to the Batn al-Hawa area of the neighborhood. ____Israeli forces then surrounded two Palestinian houses belonging to the Abu Nab family before ransacking the property and evicting the families. JERUSALEM (Ma’an) — An elderly Palestinian woman died late Sunday after being delayed from reaching a hospital by an Israeli checkpoint recently set-up in the al-Issawiya neighborhood of East Jerusalem. 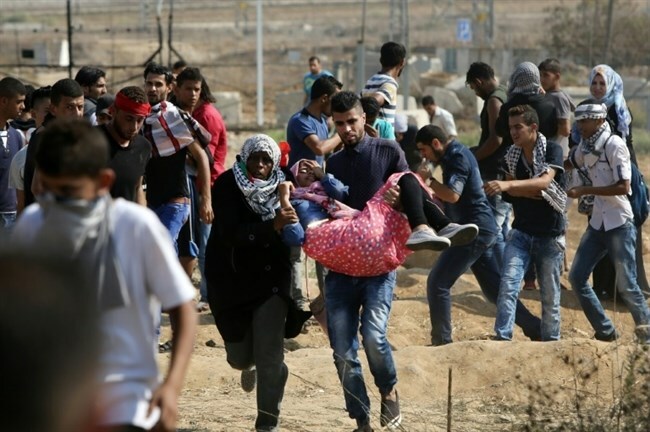 ____Huda Muhammad Darwish, 65, and her family were delayed from reaching the hospital after she suffered breathing difficulties following clashes in which tear gas was fired in the neighborhood, a local committee said. ____Her family tried to rush her to hospital, but Israeli troops ignored that there was a sick person in the car and delayed them at the checkpoint. ____Huda was pronounced dead at the hospital, although the cause of death is unclear. The Wadi Hilweh Information Center in Silwan (Silwanic), in occupied Jerusalem, has reported that dozens of soldiers invaded, on Sunday evening and Monday at dawn, various towns and neighborhoods in the city, and kidnapped twelve Palestinians, including four children between the ages of 11 and 14. ____The report follows Euro-Med Monitor‘s October 10th Call on International Community to halt Israel’s extrajudicial executions. ____The Israeli government will not provide hope, and the Palestinian Authority cannot provide it.